The modern condos at Hidden Ridge Resort feature wood burning fireplaces, full kitchens and patios or balconies. Soak in one of the two hot pools, barbeque in the covered barbeque area or take a stroll along one of the many hiking trails around Tunnel Mountain that start outside your door. 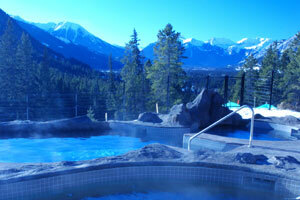 The tranquil and secluded setting makes it one of Banff's true mountain getaways. The front desk at the Hidden Ridge Resort is 24 Hours for your convenience.